Promoted by Charter Hall Direct. It's widely agreed the foundation of any retirement savings strategy for the majority of investors is balance or diversification. 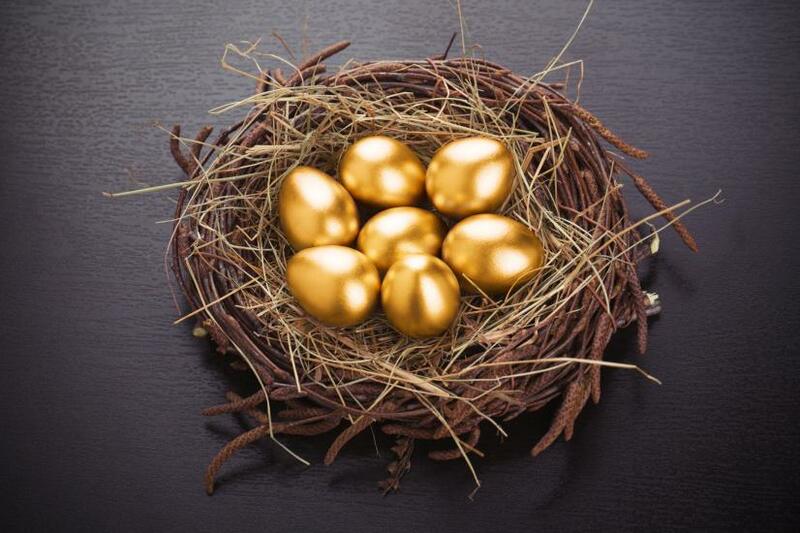 Nonetheless ‘Overweight cash and Aussie equities’ is one of the most common observations I hear from fund managers, brokers, accountants, advisers and consultants when talk turns to nestegg construction or asset allocation of the typical Australian self-directed investor or SMSF trustee or member. The reasons for this tendency are not hard to fathom. Cash, although very low yielding in the current environment, is safe; and Aussie equities are accessible, known, highly visible and well understood. What’s not widely-realised is the strong performance of a particular class of property investment, namely ‘direct property’ (also known as ‘unlisted property trusts’). Direct property or unlisted property funds, are a means for investors to own units in large, high quality Australian commercial properties that would normally be out of reach for the average person to wholly own in their own name. Examples of the most common types of commercial property include CBD office buildings, large commercial warehouses and logistics facilities and retail centres. In short, direct property provides access to high quality investment grade assets – the same class of assets owned by the big institutional and wholesale investors. The other common way investors can own units in a major property, or a suite of major properties, is through ASX listed property trusts usually referred to by the short hand A-REITs (Australian Real Estate Investment Trusts). The two big differences between A-REITs and Direct property funds is the valuation methods for units and liquidity. The price of an A-REIT is listed on the ASX and on any day the price may be above or below the underlying value of the assets in the trust, depending on market sentiment. A-REITS are also highly liquid, being ASX listed. Units in Direct Property funds directly reflect the actual valuation of the building or buildings in the fund and direct property units should be regarded as illiquid. A fund has a defined term and the units can be cashed in at the end of the term, although there are sometimes limited liquidity events during the term. 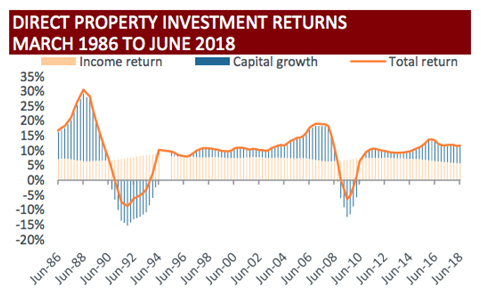 When it comes to performance, many people in the investment scene are surprised to learn how well direct property can perform and even more so when it is highlighted that the asset class has performed better that Australia equities over the last 5 year and 10-year periods. The first chart below gives a performance comparison of direct property vs A-REITS and Australian equities. 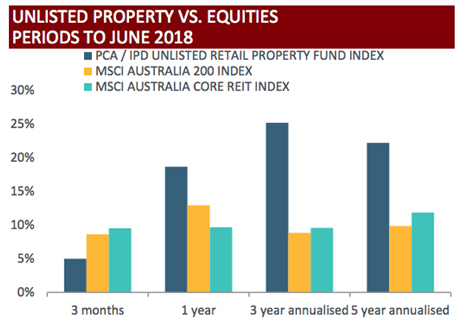 For the year to June 2018, Australian unlisted property funds posted a total return (distributions and capital growth) of +18.7%; A-REITs +9.7%; and Australian equities +12.9%. The performance of direct property over three and 5 years is also more than double that of Aussie equities! It should be noted that past performance is not a reliable indication of future performance and that different asset classes have different liquidity and risk profiles. The second chart shows a longer history of performance of direct property and details the two return measures, being income distributions and capital growth. The latter, while plotted or recorded regularly via the unit price valuation is generally only realised at the end of the term of the investment.You can see the income return being the light orange lines and how regular and stable the income paid to investors has been over a very long-time frame dating back to June 1986. These figures make a compelling argument not only for investing in direct property but also for diversification, which is how we began this article. There’s a place for cash/fixed interest, Australian equities and property of various types…including direct property. Charter Hall currently has four major direct or unlisted property funds open to investors, with distributions currently projected at: 5.8% p.a.1 (Direct Office Fund), 6.2%p.a.2 (Direct Industrial Fund No.4), 6.7% p.a.3 (Direct Diversified Consumer Staples Fund), and 6.9% p.a.4 (Direct PFA Fund). All fours funds are projected to experience significant capital growth as well, making total expected returns of between 9% and 10% p.a. over the term of each of the funds. It should be noted that Direct property funds are illiquid by their nature. 1 – DOF’s yield based on the expected distribution for DOF of 8.25 cpu (annualised) for the quarter commencing 1 July 2018, and a unit price of $1.41 as at 1 July 2018. The expected distribution reflects an increase to the 8.0 cpu (annualised) distribution paid in the previous quarter. 2 – DIF4’s yield based on actual distribution of 6.50 cents per unit (annualised) for the June 2018 quarter and $1.05 unit price at 1 July 2018. 3 – DCSF’s yield based on actual distribution of 6.75 cents per unit (annualised) for the June 2018 quarter and $1.01 unit price at 1 July 2018. 4 – PFA’s yield based on actual distribution of 7.25 cents per unit (annualised) for the June 2018 quarter and $1.05 unit price at 1 July 2018.